Though the admiral’s tone had gone gruff, his stance rigid, teasing humor still danced in the superior officer’s eyes. As lovers of Regency-set fiction would tell you, one of the most important centerpieces of social life for the gentry and aristocracy was the formal dinner party. It was not just an exercise in hospitality, it was also a social tool not only to show off one’s wealth, but also to show off the importance of the people one entertained in one’s home. Or, at least, that’s what Julia’s aunt, Lady Pembroke, would like for a dinner party in Admiral Sir Edward Witherington’s home to be. But since she has no say in the guest list—with the exception of inviting her son, Sir Drake—the dinner party in Ransome’s Honor is a celebration of the Royal Navy and its officers instead of a carefully calculated social-climbing event. A typical dinner party would have been planned for about ten to fourteen guests—though, obviously, the wealthier the family, the more people they could afford to invite. Invitations (hand-written) were sent out by the lady of the house to a carefully selected guest list with an RSVP (accept or decline) expected. Around seven o’clock on the evening of the party, the guests arrived and were shown up to the sitting room (the formal receiving room was up one level from the ground floor—known as the “first” floor—in a townhouse, while usually on the ground floor in a country manor) where they stood about making polite conversation (drinks were not served—this was not a “cocktail hour”) as they waited on everyone to arrive. As the guests were greeted and introduced and spent time making smalltalk, the hostess circulated discreetly, making introductions and arranging the couples in order of precedence. It was very important that the dignity of rank be preserved for this procession into the dining room. When a servant announced dinner served, the couples proceeded down (or in) to the dining room. Typically, the man of the house took the highest ranking lady, while the lady of the house took the arm of the highest ranking gentleman (yes, that means that couples were typically separated for this exercise). At the table, guests were seated alternating male/female down the table, and not next to the spouse—thus the importance of inviting an equal number of men and women, if not everyone expected was married. All the food of the first course was laid out on the table, ready as soon as the diners walked in. The soup tureens were placed in the middle with all other dishes in a circle around it—one of these arrangement of dishes on either end of the table for a large party. Guests would eat only what they liked, self-service style; gentlemen always offered all of the dishes for the ladies, and if it were not easily within reach, a footman was employed to reach it for them. [The wealthiest households employed one footman to stand behind the chair of every single dinner guest for this purpose, as well as for pulling the chairs in and out if the guests stood for any reason.] The butler was in charge of the meal service, the wine, and overseeing the carrying of plate. As the first course began, each man engaged the woman on his right in conversation. Once the first course was finished, these would be cleared and the second course—same number of dishes—would be served, both savory and sweet, but tending toward lighter/sweeter. In a household with young children, who would not be included in such a dinner party, after the second course was cleared, the children would be brought down, all dressed up in their finery, to be introduced to the guests and be given a few sweets from the dessert course before being sent back to the nursery not to be heard from again that evening. As the century progressed, the dessert course became the most elaborate and expensive course of the formal dinner. After dessert, the ladies withdrew to the drawing room for coffee and/or tea. Men stayed in the dining room at the table for a stouter drink and “masculine” conversation. This lasted about half an hour. Then the gentlemen repaired to the drawing room for about an hour of conversation. Between eleven o’clock and midnight, carriages were called for. In London during Season, this was then followed by attending a ball. The two books that I pulled most of the research from are What Jane Austen Ate and Charles Dickens Knew: From Fox Hunting to Whist—The Facts of Daily Life in Nineteenth-Century England and Jane Austen: The World of Her Novels. ← MENU FOR ROMANCE: Who Trusts a Skinny Chef? 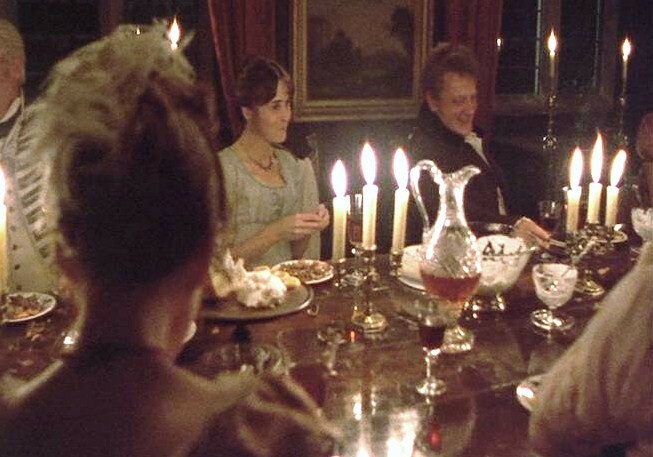 I love love love the dinner parties in the Regency novels – I love those novels anyway but it’s just one of the things that I love about them. I can’t wait to read Ransom’s Honor – it’s been so long since I’ve read a Regency I forgot how much I miss them! It’s been a long time since I’ve read a Regency—mostly because it’s hard for me to read them with all of my own research running through my head! Woo-hoo, Ransome’s is showing up in stores! Just had to share!! They must have shipped before yesterday, then! That was the last date I heard. I got my boxes of MFR in the mail Monday, so as soon as my copies of RH arrive, I can start sending them out to those whom I owe signed copies! Do any of you ever read Georgette Heyer? My favorite by her is Devil’s Cub. I’ve read several Heyers – I read Devil’s Cub a few years ago. I’ve never read a Heyer that I haven’t enjoyed. She’s a lot of fun. I just finished reading The Convenient Marriage. It was a cute story, but I found myself skimming or just flat-out skipping pages at a time. And it wasn’t Regency, as I’d been led to believe, but 1770s, when hoops and powdered wigs and everything French were all the rage. The only Heyers I’ve ever skimmed were her mysteries. I just eat up every word of her romances, she can be so funny! Convenient Marriage is an anomaly though because it does take place in the 1770s. Several of GH’s romance novels are set in the Georgian Era. In these she has fun with her heroes a la The Scarlet Pimpernel, with manly men dressed up in satins and lace and wearing fobs and taking snuff and choosing pink and lavender outfits. The Convenient Marriage is a precursor to the much more serious A Civil Contract, which investigates the intrusion of the Middle Classes into the rarified stratosphere of the upper 10,000. While I liked both books, the more serious, edgier Convenient Marriage won me over. Kaye, read Devil’s Cub. It’s great! You’re right The Convenient Marriage is Georgian. All this food in MFR and RH is making me hungry! I love all these details about your novels, Kaye!! !